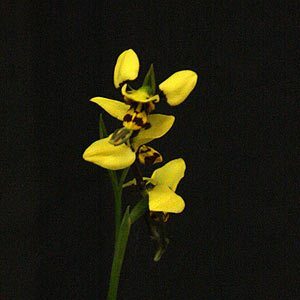 With its distinctive striped flowers Diuris sulphurea is commonly known as the Tiger Orchid. This is a terrestrial or ‘ground orchid’ from eastern Australa. Characterised by bright yellow flowers with deep red to brown markings on the lower petal. The long thin grass like foliage to 60cm is difficult to notice amongst other growth in spring however it can be identified by the folded form it takes . The tall flower spikes that can reach 50 – 60 cm are prominent. Found in from New South Wales Victoria and Tasmania with some populations in southern Queensland this is a terrestrial orchid that thives in well drained but moisture retentive soil. Found at high altitudes as well as in lower foothill and open woodland areas if left in its natural habitat it is hardy and will form a good colony. Growing in open forest areas this is another species endangered by grazing and development. This is a species that can be grown from seed, however from germination to flowering will take some years. It is not an orchid that will survive transplanting from the wild or in the garden, so if you do germinate the seed, find a permanent position where it will not be disturbed. Natural Habitat – Light to part shade in open woodland areas, well drained soil. Height – Variable height from 30 cm to 50 cm depending on soil and conditions. Foliage – Slender upright mid green, strappy or grass like. Flower – Flowers appear, yellow with deep red to purple markings. Flowering Period – Spring – September to December, depending on the climate zone. Conditions – Well drained soil, light shade. Landscaping Uses – Can be grown in a native woodland setting. Propagation – From seed or by division of tubers from larger colonies.